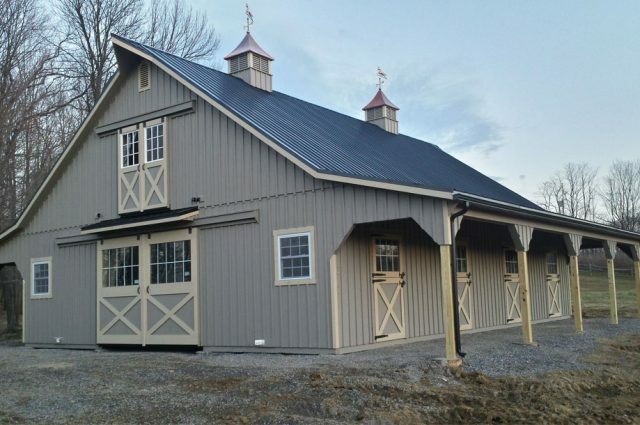 This 36’ x 48’ High Country horse barn, proudly manufactured by Appalachian Woodcrafts, has 8’ lean to overhangs on both sides of the barn to protect your horses and equipment. This barn is located in Johnstown, PA and was built with American grown eastern white pine rustic board and batten siding. The barn is painted in Haley Paint’s, clay color with tan trim. The 8 pitch roof and overhangs have black metal roofing made by Everlast Metal. The roof sports an extended “turkey tail” feature protruding out the top of each end of the barn that adds distinction. The front elevation displays a custom made window by Bird N Hand Windows that allows an abundance of light to flood the loft area. 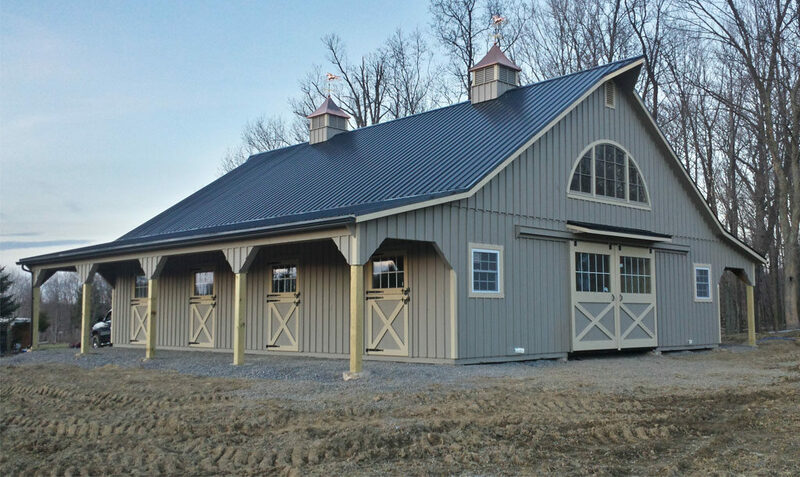 Anderson Silverline vinyl windows are installed in the lower section of the barn that adds beauty as well as efficiency. The dutch and loft barn doors were custom made by Appalachian Woodcrafts. The barn has a wash stall which adds functionality to this beautiful barn. 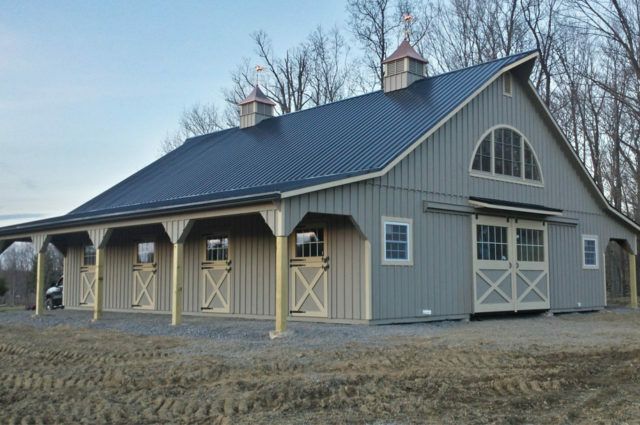 To top this beauty off, there are two 37” cupolas with polished patchen horse weathervanes manufactured by Creative Cupolas. 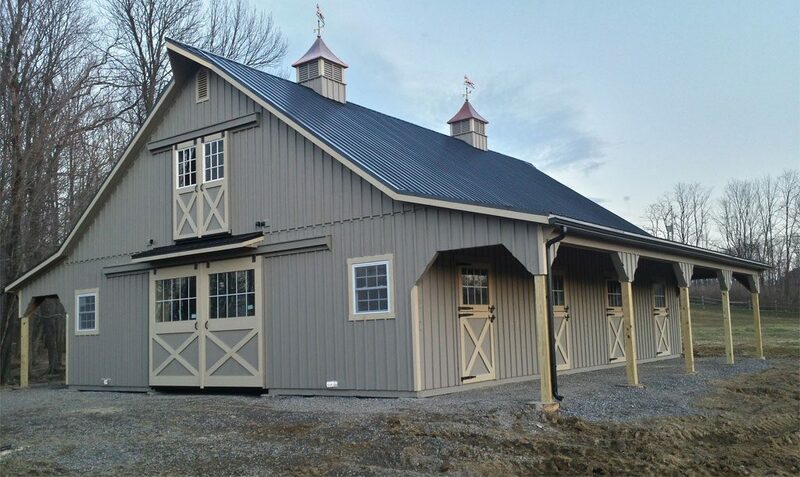 This custom made modular barn’s beauty is matched by its functional layout, sporting four stalls, one wash stall, feed room, tack room, and an open storage area to meet all of your needs. The upstairs loft area can be utilized for storage space or for future office space. This barn is built sturdy with unsurpassed craftsmanship that will last for future generations.